Dr. Flora Stenger http://www.lagunasmiles.com/dr-stenger/ offers high quality and affordable dental implants in Laguna Hills for patients with missing teeth to help restore the appearance and functionality of your smile. Laguna Hills Dentistry has a state of the art medical facility that is well-equipped with latest medical equipment to enhance your dental implant procedure and overall experience. 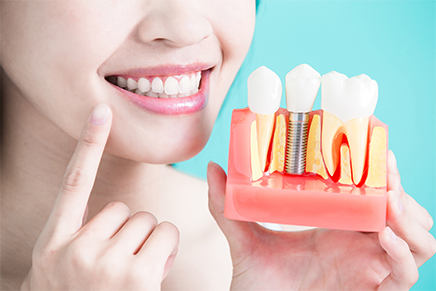 Dental implants are the perfect permanent solution for replacing damaged or missing teeth with new ones that look, feel and function like natural teeth. With dental implants, you regain the ability to smile with confidence knowing that your teeth appear natural and aesthetic. Dental implants are comfortable, natural looking and the long-lasting option to having removable dentures. The implants are very strong, stable and durable. How is dental implant procedure conducted? Dental implant procedure involves a surgical placement of titanium anchors, which acts as tooth root substitutes, into the jaw bone. Small posts which protrude through the gums are then attached to the dental implant. The implants are then left beneath the surface of the gum to gradually bond or fuse with the jaw bone for three to six months. Once the dental implant has bonded well and is secure in your jawbone, a permanent teeth-like porcelain crown is then attached to the titanium dental implants to ultimately improve both your teeth function and aesthetics. Dental implants are becoming the go-to procedure to fill the space left by missing tooth because of its high success rate. Dental implants are a long-term investment in your smile, oral health, and overall well-being. Dr. Flora Stenger and his highly trained medical team provide excellent dental implant restoration and dental care. We use simple patient-focused techniques that aim to prioritize on your comfort and safety. Come for Dental Implant Consultation at our conveniently located facility in Laguna Hills so as to gain more information regarding the procedure such as cost of dental implants, what to expect, and whether or not you are a good candidate.